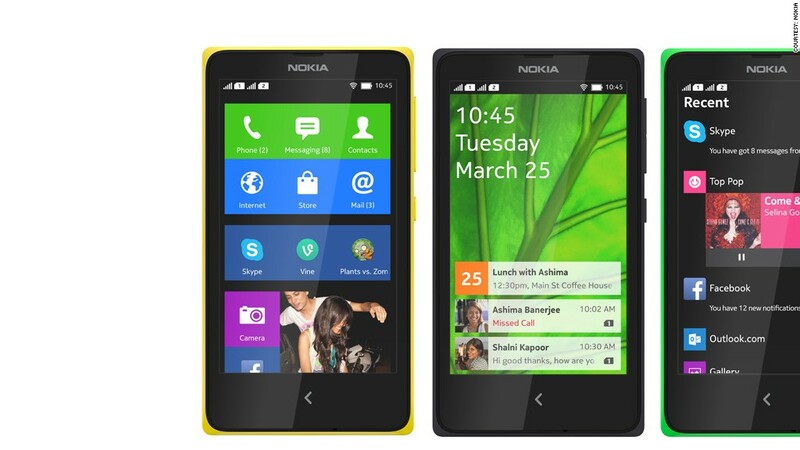 The new Nokia X phones are aimed initially at emerging markets, and cost between 89 and 100 euros each. Just months after being sold to Microsoft, Nokia is planning to release a wave of Android smartphones -- with a difference. Nokia (NOK) CEO Stephen Elop took to the stage at Mobile World Congress to unveil three low-end Android phones mostly intended for emerging markets. Selling for between 89 and 109 euros ($149), the Nokia X, X plus and XL phones appear designed to introduce users to Microsoft (MSFT) services, rather than compete with Nokia's main Lumia line of Windows devices. While this may be an Android phone, the look and feel is anything but. It has its own user interface, which resembles the flat, tiled look of Windows phone in many ways, while maintaining Nokia's flavor. Built on the open source version of the Android operating system, none of Google's (GOOG) services -- including its Play app store -- are included. Android apps can be added, but much of the OS has been customized to highlight Nokia and Microsoft's own services, including Here Maps, and the Bing search engine. Nokia has also included its own apps for things such as email and camera. The hardware for each device is nothing special. The phones are thicker, heavier, and less powerful than many mid-range Android devices, but Nokia maintains that affordability is its main goal. Elop said Nokia's entire line of devices will be under Microsoft's control once the acquisition is finalized, so even these non-Windows Phone handsets will tag along. So what's the significance of the Android launch? For now, it seems like an experiment. Microsoft and Nokia have done OK with the Windows Phone considering their late entry into the market, but still only have a fraction of the market share that Apple (AAPL) and Google have with their operating systems. A recent slump in Nokia smartphone sales hasn't helped. The move may seem to run counter to Microsoft and Nokia's desire to grow the number of Windows Phone users. But the Nokia X phones are aimed at people currently not served by the Lumia range: the 100 euro crowd. By targeting emerging markets initially, Microsoft is trying to make itself recognizable in areas where people wouldn't buy a Windows Phone right now, but might in the future as the cost of smartphones falls. If the X turns out to be a modest success, Microsoft could give it a bigger push as it develops services across multiple platforms. And if it doesn't pan out, chances are this was a low-risk endeavor, so not much will be lost along the way.